**** Chosen by Winner: Warren H.
The Jarosz Choppa, a large corn machete-style fixed blade, is made in the USA from 0.188" thick 1095 Cro-Van steel, measures 15" overall and has a blade length of 9.875" and width of 1.688". The handles are Ultramid®. A heavy-duty polyester, MOLLE-compatible sheath comes with the Choppa and allows for the smaller KA-BAR Jarosz Globetrotter to attach to the front of the sheath using MOLLE technology. The Jarosz Turok is made in the USA from 1095 Cro-Van steel. It measures 11.5" overall, features a blade with a 6.25" length and 1.563" width, and is sold with a Celcon® (plastic) sheath. The Jarosz Folder is a drop point liner lock knife featuring a hollow ground AUS 8A stainless steel blade and glass-filled nylon handle. Designed with a moveable clip for tip up or tip down carry, this modestly sized folder is perfect for pocket or pack. 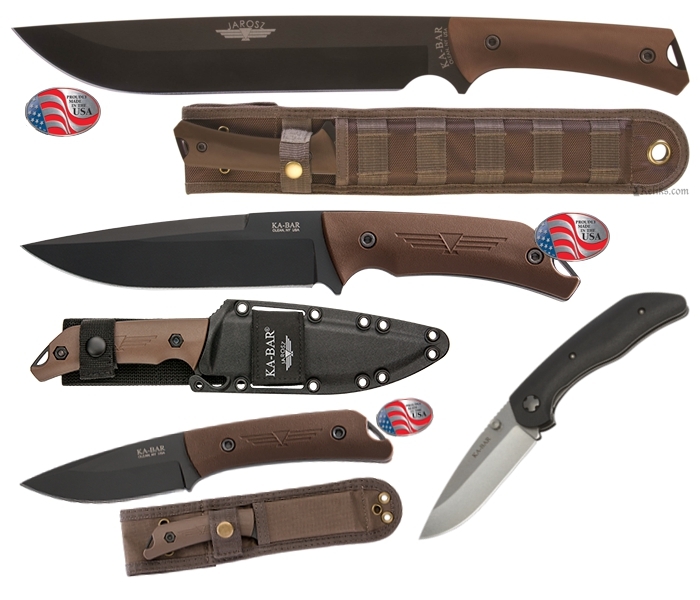 All at a fraction of the cost of Jesse's custom folders.